After spending some time in canoeing and kayaking in Ontario’s wilderness I headed to Quebec Eastern Townships for a road trip. I love road trips. I was really looking forward to a few days of just me and the open road, driving past cute villages and beautiful scenery. Eastern Townships is a collection of villages an hour east of Montreal. It was originally settled by loyalists fleeing from the United States during the Revolutionary War. Thus the very un-French names of some of the villages: Sherbrook, North Hatley, Sutton, etc. The landscape here is very different from what I’m used to in the West Coast. There were rolling hills dotted with small, neat farmlands, unlike the never ending fields and the occasional feedlots one would see along I-5. The houses are made of grey stones or red bricks or clapboard siding, and the churches are adorned with tall, white steeples. At times I felt like I was driving through a Christmas postcard (minus the snow). What I love most about driving around the Eastern Township is that it doesn’t matter which road I take, there will be beautiful sceneries around me. Either rolling hills dotted with vineyards, historic and cute villages, or farmlands with charming barns and grazing cows. Throughout the trip, I got lost a lot. My iPhone and the Garmin were shouting contradictory directions the minute I left the car rental place. I hated it at first because I had to resort to the old fashioned way of getting around: by stopping and asking for directions. And making a LOT o u-turns. I felt like I was wasting a lot of time. Then I realised, with scenery like this, why the hurry? Along with the scenery, here some of my favorite stops I’ve made during my road trip. I saw Saturn for the first time at Mont Megantic Observatory. It was such a cool experience I was grinning like a deranged Cheshire cat for the next 24 hours. 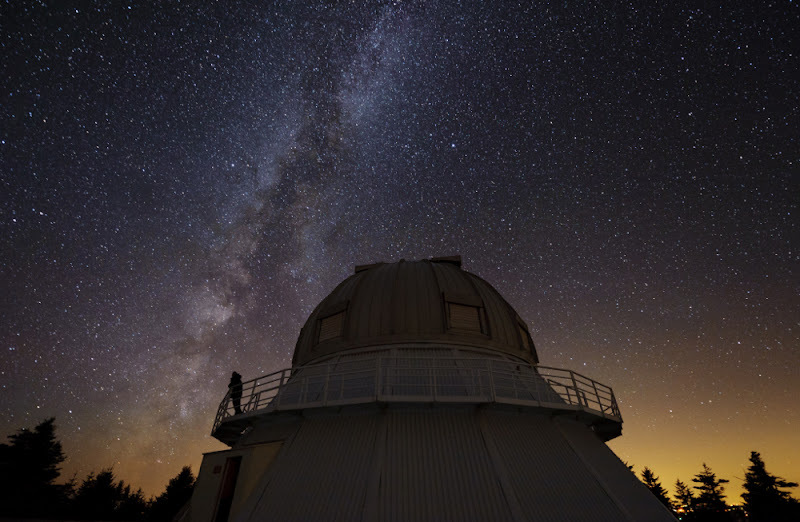 Two nights a year, during the Festival d’astronomie Populaire du Mont-Mégantic, the observatory’s large telescope is opened to the general public. 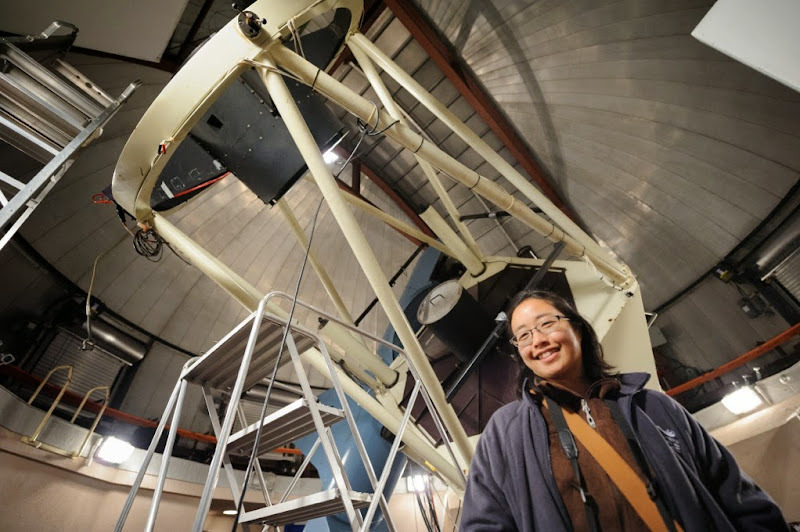 Don’t you ever want to know what it’s like to look at the universe through a research grade telescope? Here’s your chance! If you’re there during any other time in the summer, you will have the opportunity to gaze through their smaller (61 cm) telescope during their Astronomy Evenings event. When I got there, there were clouds in the sky, but for a few minutes it opened up enough for us to get a glimpse at Saturn and its rings. It was so, so very cool! I absolutely loved my time geeking out over the universe here. Mont Megantic Observatory also happens to be located in a national park with the same name. Hiking its trails will take you to the summit of its mountains from which you have an almost 360 degree view of the surrounding area. The photo above is taken from the summit of Mt. Saint Joseph. Near Sutton, there’s a place called Au Diable Vert (the Green Devil). I’m not really sure what to call this place. It’s a ranch-slash-farm-campground type thing. It offers tree-houses, cabins, and themed tents for people to stay. It also has its own private network of hiking trails, a collection of Highland cows (only the cutest breed of cow, ever), and a ride that consists of a bike flying through trees. The last part might be easier to explain with pictures than words. Its owner, Jeremy, is an eclectic businessman that likes to add whatever projects he deems ‘cool’ to the property. Thus Au Diable Vert became a place that no word can properly define. Whatever Au Diable Vert is, it’s a fun place to visit to hike and coo over baby Highland cows. And to ride a flying bike. B&B’s are the place to stay when visiting Quebec Eastern Township. Some B&B owners are actually trained chefs and the meals I’ve had in Eastern Township B&B’s were some of the best I’d had anywhere. Audrey is a resident of Lac Megantic, a town of 6000 located by the lake of the same name. She asked me if I’d tried poutine. “Yes, in Toronto,” I said. “Did the cheese squeak?” she asked. I answered in negative. None of the cheese I’d eaten ever uttered a single noise, squeak or otherwise. And friends, fresh cheese curds do squeak (want to learn why?). It was both weird and exciting. I’d never thought I could be that excited about cheese curds before. I’ve taken a lot of road trips before. Some with Jack, some alone. 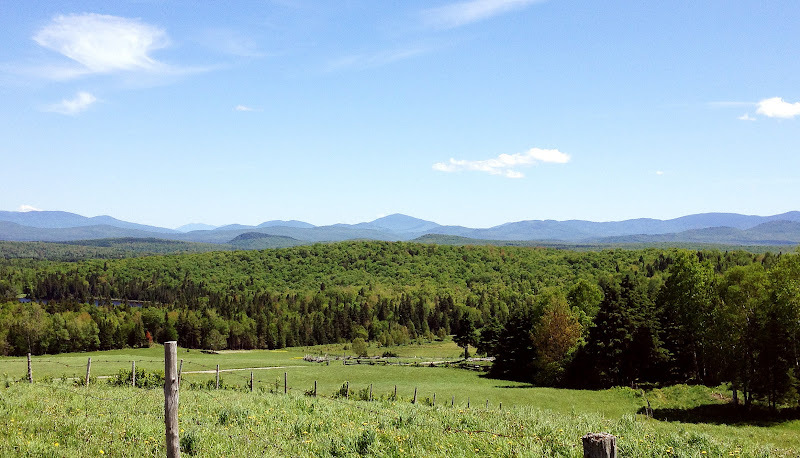 Because of the people I’ve met, the scenery, and how glitch-free everything was (Garmin GPS excluded) – this road trip through the Eastern Townships of Quebec easily ranks up there among some of my fave road trip experiences. Mere hours after I finished writing this post I heard the news that a train carrying crude oil exploded in Lac Megantic – the town where I had my first squeaky cheese experience. The same downtown area I walked in pursuit of fresh cheese curds with Audrey was obliterated in the explosion. 5 dead and more missing. It’s such a tragedy I still can’t wrap my head around. Entrance fee to Au Diable Vert: $5 for day use. Accommodation prices vary. The picture of the observatory is stunning. How did you manage to get the stars in so clearly? I have never been to an observatory, but would love to visit one one day. Seeing Saturn must have been so cool! I spent just over a week cycling the Eastern Townships a few years ago and remember one delicious breakfast after another. I had the best Mexican food ever in Magog – unexpectedly. Your timing couldn't have been better to visit the Megantic area – I'm thinking before the fire. The hiking looks divine and all in all it looks like you thoroughly enjoyed yourself. I was completely oblivious to the fact that the Quebec country side had so much to offer, it looks spectacular. And that photo of the night sky…wow! The baby cow is so cute! It's so fluffy! I also want to try riding a flying bike. And are those real flowers (first food photo)? Jack 🙂 please call me when you have time. Astronomy places are pretty cool aren't they?! I went to one in New Zealand recently and have been paying the constellations a lot more attention since then! I think it helps that you can actually see the stars over here, unlike back home in London! Oh my gosh, look at all the stars! I would have geeked out too. We don't see many stars in China. And that cow is just the cutest. I probably would have tried to pet and/or hug one. Lol, I actually got to bottle-feed one. Super adorable I wish I could take one home!! As someone whose childhood dream was to grow up to be an astronaut, I love geeking out at observatories, too! Funny story: the observatory in Sydney (Australia; not Nova Scotia) has 2 domes because after building the first one, they realised the view was blocked by the clock tower. Nobody in our group believed it, but our guide for the night assured us numerous times that it was true. Jack and Jill went up that hill and SCORED! My recent post Does Her Mother Know? I love road tripping. I do it as often as possible living in BC, Canada. The mountains, the sunsets, lakes and ocean ~ absolutely fantastic for photography. I am driving back to Vancouver next week 4 hours away but last week I drove to Vancouver then up to Whistler 6 hours and the views were great. My dream is to drive from Kelowna, BC to Louisiana but I'd also love to go from Kelowna to Eastern Canada. Looks like you had a very cool and delicious time there. On a sad note I am not sure if you've heard of the large train explosion that occurred in Quebec in the small town of Lac-Megantic in the south east near the Maine border. 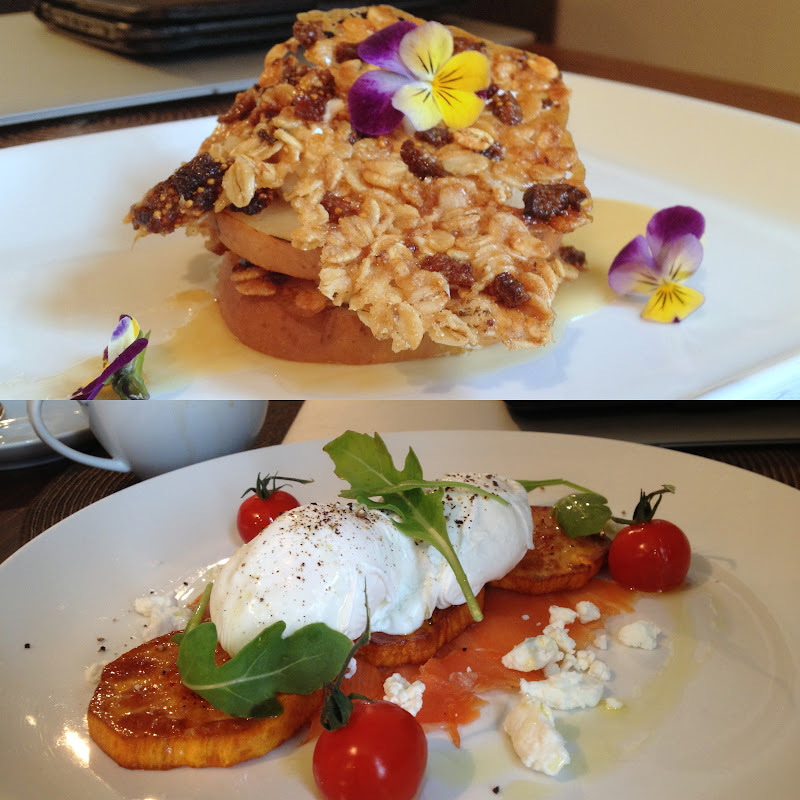 The food looks like a work of art. Certainly shows some of these B&Bs are owned by chefs. Love the photos of scenery too. Beautiful! I am a die hard road tripper. I love it. There is little that makes me happier than just driving back roads and discovering the smaller parts of a country. And, despite growing up in Wisconsin, I didn't have the cheese curd experience until later in life, and I'm totally with you, they are to die for.